I'll go through this entire process about once every two weeks or whenever I'm feeling froggy. Most of the time I'll just do bits and pieces here and there. For instance, I don't use sugar scrub every day. Nor do I have a schedule for using it. Sometimes it'll be twice a day, sometimes once every day for three days, other times I'll go a few days without using it at all. It just depends on whether I feel like it or need it. So most of these procedures are optional. All but pushing back your cuticles and keeping them hydrated. That's the one thing I do do consistently: moisturize. At least half a dozen times a day. I carry cuticle oil, cuticle balm, and hand lotion with me everywhere, and use each throughout the day. I push my cuticles back every other day ish. Again, it just depends on how they're looking. If they don't need to be pushed back for a few days, I'll leave them alone. Just judge for yourself on what you think you need. With time comes experience and you'll figure out a good routine that works for you! 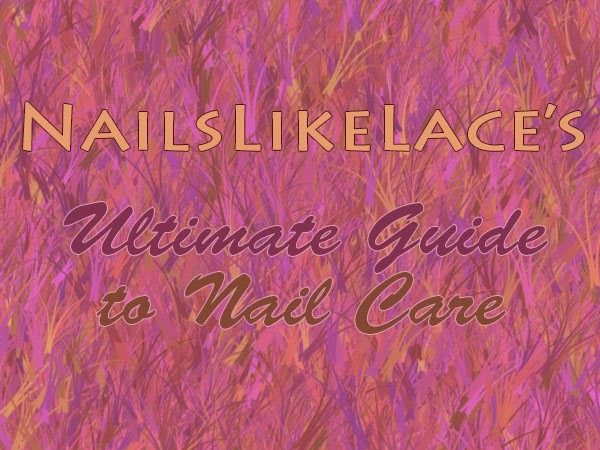 So to kick off my ultimate nail care guide we need to get those babies clean! Remove any old polish from your nails before beginning. I go for a plain cheap remover. The one shown is not Zoya Remove+ (Blech! I hate that stuff! It is sticky and leaves a weird residue. Not a fan of the awkward smell either. ), I just love the pump bottle so I keep refilling it. I jump around when it comes to remover. I always use the store brand from wherever I happen to be shopping when I need to get more remover. I like the moisturizing and strengthening ones. So I switch back and forth between the two. I'll use up a bottle of the moisturizing remover, then get a bottle of strengthening, and back and forth. It seems to work pretty well for me versus just using one or the other. I also like to throw in a little pure acetone. I don't like to use straight acetone as a full remover since it is so drying. It is amazing for lacquer removal though, and I love the removing strength, so my pump bottle is typically 3/4 cheap non-acetone remover, and 1/4 100% pure acetone (again, cheapest brand wherever I happen to be shopping). I normally don't really care if my nails are stained since I always keep them polished, but I was messing around one day, got bored and figured I'd try using denture tablets to whiten my nails. I've tried everything else. Lemons are crap. Toothpaste is junk. Those store-bought whitening soaks don't work. Denture tablets are the best thing I've ever found since joining the online nail community when it comes to whitening your nails. They do work better if your stains are fresher, but the results are pretty surprising! Put enough warm water in your cup to cover your nails, throw in a denture tablet and soak for at least ten minutes. Rinse and move on. Now we need to take care of those unruly cuticles. A cuticle remover isn't actually necessary. I only started using one about six months ago just for kicks. Before I would apply some cuticle oil, rub it in a little, then push them back. I decided to try an actual remover, though, so this is what I've been using until it runs out. It's nothing special. It does sort of seem to work quicker than oil did, a little, maybe. You just apply the remover to your cuticles so it can soften them up, then scrape any dead skin off your nail bed and push back your cuticles. Using the remover is not always necessary when pushing your cuticles back, either. If you've got some cuticle and dead skin buildup on your nail bed, then it will help. If your cuticles are doing pretty good but just need a bit of tidying, you can push them back a little without using anything. I do recommend a plastic/rubber cuticle pusher rather than a metal one. Especially if you're just starting out. If you press too hard with the metal pushers, they can dent your nail. You may not notice it immediately, but once they grow out a little, you'll start seeing small indentations in the base of you nail bed. That's really not an issue if you're constantly wearing polish, but I just prefer the plastic one. It works fine for me. It is a little more flexible so I actually find it to be a lot easier to use than a metal cuticle pusher. You can also use an orange wood stick (a.k.a. manicure stick) for this but I'm always afraid I might give myself a splinter trying to push my cuticles back with those things! Here is also where any necessary filing and buffing occurs. Since my nails are strong enough to handle it, I use a rougher 100 grit file to take down length, followed by a super smooth file. If your nails are weak, I suggest using a medium or high grit file only. This is something newer I have added to my routine and I am absolutely loving it! It makes my hands so soft! Don't go buy a $6+ pot of sugar scrub. Invest that money in a small bag of sugar and a small bottle of olive oil instead! I don't have any exact measurements because I didn't keep track (here's a good tutorial for a DIY sugar scrub though), but I used about two cups of plain ole sugar, approximately 1/8 of a cup of vitamin E oil, and about 1/4 of a cup of olive oil. Mix it all together and you've got your own sugar scrub that works wonders! It'll have a somewhat wet sand-like consistency and it is so moisturizing! Scrub your hands, nails, and cuticles for around 30-60 seconds. Give them a quick wash and dry, then you're ready for some hydration. Moisturize those cuticles! It is the #1 best thing you can do for your nails and cuticles! I've said that for years now and I still swear by it. With consistent moisturizing, they'll begin growing long and strong in a matter of weeks! No "miracle cure" products are going to get the job done. I don't care what other people think of OPI's amazing "repairing" products, Duri's holy grail base coats or Orly's awesome treatments. They're junk. Stop wasting your money. Sure they may make your nails feel nice and strong while you're wearing them and shortly after, but they're not actually soaking into your nails and healing them from the inside out. Drown your nails and cuticles in oil and balm until you don't think they'll be able to absorb another drop. And then give them more. Every day. Kill them with oily love and you'll notice a difference once they start growing out. I don't have any real favorite cuticle products, I use a lot of different ones. Pictured is a watermelon cuticle oil from 365 Days of Color (that smells divine! ), a homemade cuticle balm I made from beeswax, olive oil, vitamin E oil, and shea butter, and Sally Hansen's Cuticle Eraser+ Balm. I also use pure vitamin E oil, 365 DOC balms, Bert's Bees, etc. Anything will do, just as long as you're moisturizing! I like to use the oil first. Rub that in, then use a waxy balm to seal the moisture in. Throughout the day, I use any of these products in different combinations. Sometimes just a little oil, sometimes just a little balm, sometimes both. All day. Dusk til dawn and dawn til dusk. I also have an overnight treatment. So yea, dusk til dawn too! Now that your cuticles are thanking you, you're almost to the final step! Finish off with some hand lotion. In which I am a little more particular than with cuticle hydration. If you're going to use a hand lotion/cream, invest in a good one because those cheap watery ones are worthless. They're doing nothing for you. I prefer a thicker, richer, more butter-type of hand lotion. They just seem to work so much better. Here I am showing J.R. Watkins Apricot and Pequi Oil Body Butter (don't waste your money, the tub looks huge, but it's over-priced and contains little product, doesn't do the best at moisturizing as expected for the price), Nivea Macadamia Nut Hand Cream, and O'Keeffe's Working Hands. I also use Bath and Body Works hand lotions (only in a pinch, they're pretty craptastic too even if they do smell heavenly), and P2 Hand Serum. Same goes for hands as cuticles, I like to use my more liquidy, faster-absorbing lotion, then seal it in with something waxier. Last but not least, if my hands are feeling a little dry or the weather is taking a toll on my nails, I'll slather up my hands with a homemade beeswax lotion bar and/or petroleum jelly, and wear cotton gloves (never rubber, you want them to breathe, not suffocate) to bed. This is great for an intense moisture treatment! You should always apply a good hand cream before bed anyway because you aren't going to be doing a lot with your hands, so they have time to soak it in, but for a little extra oomph, go with a nice thick coat of Vaseline and gloves (target problem areas on your feet and wear socks to bed too). It'll do great things! So that's it! I rarely get breaks or peels and I've been doing most of these things for 2+ years. Of course, I have to say that everything stated here is what I've learned from my own experiences. No facts are based on studies or anything. I'm simply telling you what works for me. Not everything may work the same for everyone, so don't hold me liable if you go buy a certain product and you have an allergic reaction or accidentally blind yourself with sugar while mixing your scrub or something. I don't know what to tell you. Wear goggles next time. If you have any other nail care questions, comments, concerns, anything, don't hesitate to get in touch with me. I enjoy passing on the things I've discovered to other nail girls!